After a brief 25 hour delay in Morocco on his way from Niger, Bombino arrived in Woodstock, New York to record his 2016 album at Applehead Studio with Dave Longstreth (Dirty Projectors). 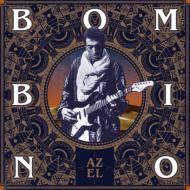 Longstreth proved to be a fantastic match for Bombino as this album's producer. He has a deep respect for the Saharan music tradition and guided their sessions with a gentle but skilled hand. Fans of Bombino and Tuareg music in general will notice a few remarkable innovations on this album. The first is the introduction of a new style that Bombino is pioneering that he affectionally refers to as 'Tuareggae' - a sunny blend of Tuareg blues/rock with reggae one-drop and bounce. Another is the first-ever use of Western vocal harmonies in recorded Tuareg music, (due to Longstreth's influence) which give the songs new depth and color. Finally, the band is tighter and more energetic than ever before. The result is Bombino's best, most well-rounded, and groundbreaking album to date.